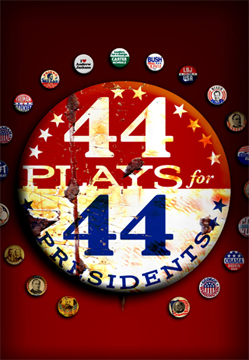 "44 Plays For 44 Presidents"
As the election draws near, Bad Habit Productions will present "44 Plays For 44 Presidents" at the Calderwood Pavilion at the BCA. Playing from October 27 - November 11, the production is part of the National Plays for Presidents Festival. Jeffrey Mosser directs. "44 Plays For 44 Presidents" is a 2-hour show comprised of short, biographical scenes highlighting the lives of all the American presidents. Their mistakes and successes are celebrated by a company of actors who take turns donning a star-spangled coat that symbolizes the presidency. The company features Morgan Bernhard, Brenna Fitzgerald, Britt Mitchell, Brooks Reeves, and William Moore. Beginning with George Washington’s almost Eden-like perfection, the scenes shift frequently between the comic and the tragic, from Ben Franklin giving Thomas Jefferson a Borscht Belt-style roast, to the frank portrayal of William Henry Harrison’s life as an “Indian slayer,” and later the grim onset of the Civil War. Act II starts off the twentieth century with the assassination of William McKinley, moves through a Nixon-praising dance number and a George Bush, Sr. mini-musical about dirty campaigning, and arrives at a polarized America in both the George W. Bush and Barack Obama plays. Audience members will be left to ponder where the presidency has gone since its fall from paradise… and where it may travel next.